I have profiled Juan Carlos once before, in 2002. On that occasion we tasted through the impressive portfolio of wines from the estate he founded in 1985. Earlier this year we met up again, this time not only to look at the current batch of Rioja wines on the market, but also at the wines from Artadi’s more recently established estates in the Navarra and Alicante regions of Spain. Juan Carlos presented a tutored tasting of his wines, including the top Rioja, El Pison 2004, which has recently earned the perfect 100-points from Robert Parker’s Wine Advocate. That of course means the wine is extremely difficult to find, and prices for it have soared to over £200 per bottle. Thankfully the excellent Rioja Viñas de Gain can be had for a more reasonable £12 or £13 despite its 94-point rating, and the wines from Navarra and Alicante start at around £6. Berry Bros is a main stockist of all of these wines, and links to stockists on wine-searcher are also given. Artadi’s vineyards, in the Rioja Alavesa sub-region, cover a wide range of soils and sub-soils including chalk, gravel and clay. He explains that the particular climate of the region has both Continental and Atlantic influences, and that these contrasting elements are crucial in shaping the style of Artadi’s wines, which tend to be fruity, deep and smooth, yet to retain freshness and vivacity. Only the Tempranillo grape is grown here. This is an excellent range of Rioja wines that has captured the attention of critics and collectors world-wide. The range culminates in the single vineyard wine ‘El Pison’, from a 2.4ha vineyard in Laguardia that was planted in 1945 on sandy soils over limestone. Juan Carlos farms organically, and uses only French oak barriques for maturation. This wine is Artadi’s new “entry-level” wine, from vines that are young and not yet considered good enough for Artadi Vinas de Gain or above. It has a solid, vibrant ruby colour with violet on rim. Very clean, fruit-forward nose, with bold crunchy raspberry fruit. There’s a blue/black fruited note too. Lovely sweetness of cherries and Parma violet, with a palate that is expressively fruity, with a chocolaty undertone and long, supple finish. Good balance and fresh acidity. 87/100. Around £8.50, See all stockists on wine-searcher.com. Lovely rich, deep, crimson black. Deep, sinewy, sensuous nose, with a plush red fruit quality, giving a velvety impression with hints of herbs and woodsmoke, its tight personality revealing hints of mocha and complexity. The palate has beautiful fruit, with that signature balance of concentration and richness and fresh fruit and acid character. Lovely mouthfilling vinous wine, with structure and presence, lovely fruit quality and the potential to age. 92/100. Around £13.00, See all stockists on wine-searcher.com. Trodden by foot, the grapes for this wine come from 15 plots of vineyard, all over 50-years-old. Very vibrant crimson/black. Cedar, truffle and a nice suggestion of gamy, bloody character are immediately appealing. A rich bramble and Autumnal berry fruitiness comes through, with complex background notes of violet, mocha and hazelnut. On the palate there’s a vanillin and rich cedary character, but the intense, concentrated and glossy black fruit powers through. This has a background sheen of that cedary oak, but spice, liquorice and woodsmoke is alluring and mouth-filling. Beautiful wine. 95/100. Around £45.00, See all stockists on wine-searcher.com. 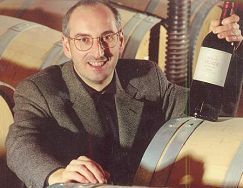 In 1996 Juan Carlos made his first foray into other territories, establishing vineyards in Navarra, just to the east of Rioja. Here, he says “production is defined by limestone and clay-calcareous soils. There are poor and rugged plots, and the climate is hard: dry and hot in summer and cold and humid in winter.” He explains that Garnacha (Grenache) is the “authentic” grape of this region, and Artadi managed to buy some excellent old-vine Garnacha vineyards around the village of Artazu, where they have now built a modern winery. The small range of wines produced here is topped by Santa Cruz de Artazu, from vineyards planted almost 100 years ago, and which yield only 20-25 hectolitres of grapes per hectare. Juan-Carlos told me he first spotted the vineyard whilst showing Randall Grahm of Bonny Doon around the region. This is a saignée from the Garnacha red, of around 10% – 15% of the must. Pale, quite vibrant pink colour. Very open and fruity, with lovely bright rose hip and cherry notes, and plenty of soft, summery strawberry. A nice sweet-fruited edge to this, with really bold, crunchy, mouth-filling fruit. The acidity is fresh, and there’s a terrific tang of herbs and crunchy pomegranate acidity. Lovely stuff. 87/100. Around £6.00, See all stockists on wine-searcher.com. Six months in older French oak barrels. Tank sample of the final blend, which was about to be bottled when I tasted it. Very bold red colour, with a distinct pink rim. Bold, crunchy, very haunting Garnacha fragrance, with plenty of bright, schisty raspberry fruit and tiny notes of liquorice, cherries and mint. Lovely finesse on the palate, and the fruit profile follows through, with some structure, and plenty of bold, crunchy fruit and terrific acidity. Real tang, vibrancy and length here. Most impressive. 87/100. Around £6.00, See all stockists on wine-searcher.com. From a plot of 90-year-old Garnacha that yields only around 20,000 bottles. 20% New wood, all French and in barrel for a year. It has a dense, solid crimson colour with some pink on the rim. Concentrated, silky, very intense with a curranty richness, but not stewed or raisined – a very fresh, minty character, with bold fruit and a background. Beautiful palate, with masses of silky fruit flooding across the palate and a really grippy tannic structure. Spices and herbal notes and a fleshy, long finish. 91/100. Around £17.00, See all stockists on wine-searcher.com. Alicante is on the Mediterranean coast of southern Spain, but Juan Carlos explains that the El Sequé vineyards are as far from the sea as can be found in Alicante, with a cool micro-climate. His Monastrell vines are 40 years old, and since last vintage Juan Carlos has ripped out or grafted the small amounts of Cabernet and Syrah to be found in the 2006 Laderas de El Sequé tasted below, to be replaced by more Monastrell (Mourvèdre) – the grape he believes is best suited to quality wines in this region. Alicante, though famous now for its mass-market tourism, is in fact a wine region with a long history. Juan Carlos acquired this property in 1999, consisting of 40 hectares planted on brown limestone soils. 80% of the vineyard is currently planted to Monastrell. Monastrell, Syrah and Cabernet Sauvignon. This is made from younger vines that Juan Carlos has planted, and it spends a few months in older barrels, with a “second wine” philosophy of allowing fruit selection for the El Sequé first wine. Very dark crimson/black colour with a hint of violet, with a very pure schist and raspberry fruit character. Good dark, raisiny concentration of fruit, and onto the palate this is stylish and supple, with rich, jammy fruit, but also a bit of chocolate and plum coming through in a very silky, suede-like finish. 87/100. Around £6.00, See all stockists on wine-searcher.com. Very dark and dense all the way to the rim. Dark, chocolaty and blueberry aromas, with plum and damson fruit, and still some cherryish vibrancy. There’s a note of briar and truffle just in the background. On the palate Very smooth and silky textured, with a smoky, polished old wood quality, and a very vibrant, palate filling concentration and sweetness of fruit. Supple, polished tannins begin to bit, and a really good acidity adds lots of structure. Really quite complex and chewy, but has refinement too. 90/100. Around £13.00, See all stockists on wine-searcher.com.